Our Custom Personalized Mint Tins are a sophisticated and unique way to remind your guests of the fabulous time they had at your Bridal Shower! Personalized Mint Tins are a trendy and practical Bridal Shower Favor to give this season. Our Bridal Shower designs are current and fun along with a few classic designs. Whatever type of Bridal Shower you are having, we are sure you will find just the right Candy Tin design to complement your theme. FREE Customization! Do you want a unique one of a kind Custom Mint Tin Favor? Email us info@candyundercover.com or call us toll free at 877-235-2828 and we will be happy to customize a label for you FREE! We will also add a photo to your label FREE! Just email us your photo it's that simple! 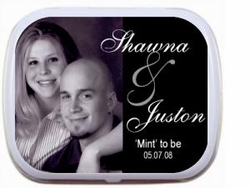 Each Bridal Shower Personalized Mint Tin is individually shrink wrapped and includes mints or candy of your choice from our selection. If you have any special requests regarding the layout or wording of the tins, please let us know. We will do our best to accommodate all requests. Keep in mind that colors on the screen may not match the colors on your screen so there may be slight variations on the printed product.